Hertford Town's Yemi Atta tangles?? (maybe) with Billy Healy. No foul was given which I think was the correct decision. Twentieth placed Hertford Town welcomed fifth placed Hanwell Town to a very chilly Hertingfordbury Park on Saturday afternoon for a Spartan South Midlands League Premier Division game. Hertford are in a real relegation battle along with Holmer Green, London Tigers, Hatfield Town, Hillingdon Borough and maybe Biggleswade United who look to be just out of it at present. Looking at their league position Town need to pick up some wins soon so that their Premier Division status is preserved at the end of the season. Hertford manager and local non-league legend Marvin Samuel has been working hard to get his team away from the bottom of the table and has turned over a large amount of players in his squad over the season. No fewer than seven made their home debut in their last home game which was won 2-0 versus Tring Athletic. Hanwell Town included ex Hertford Town (and Enfield Town) man Billy Healy in their team whom had recently left Hertingfordbuty Park for Reynolds Field in October. He was given some friendly stick and banter from the noisy Hertford contingent present and was involved right from the off. He has formed a really decent partnership up front alongside Ricky Pither. Hanwell took the lead early on with a decent shot from outside of the box the Hertford keeper seemed to be caught out by. 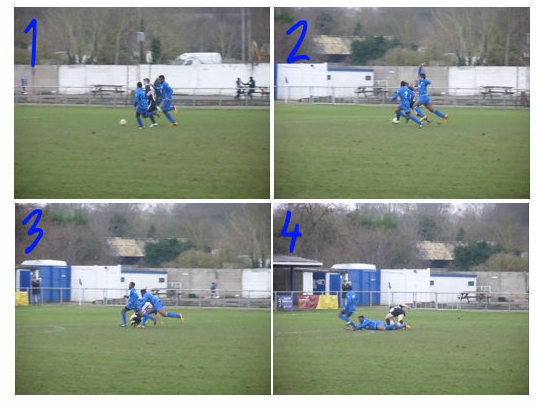 Healy then went on run and at the edge of the box tangled with Hertford defender Yemi Atta, there were some appeals for a foul, which if given could of been considered a sending off, but in truth it was the correct decision made by the referee to play on in TheColdEnd's opinion. Healy had played for Hertford in the game at Hanwell in September which was a bad tempered affair in which the away side had two players sent off and lost 3-2. An indication the turn over of players can be drawn from the fact only Michael Elliott and Kardan Campbell remainded in the Hertford starting XI from that game. Marvin Samuel started yesterday playing centre back in partnership with the previously mentioned Yemi Atta (ex of Enfield Town reserves). The second half saw lots of Hertford hard work and pressure. They didn't look like the same team from the first half and were very unlucky to come away from the game with nothing. Hanwell had a few good chances on the counter attack and hit the post when it really did seem easier to score along with two good saves from the home keeper late on. If Hertford play as well as they did in the second half yesterday they will start to pick up a few welcome wins in their next few games. Hanwell are a good side and this was their tenth league win on the trot. If they can keep their team together for next season I think they could be right up involved in the championship race. The defeat sees Hertford slip into the dreaded bottom two as London Tigers recorded an all important relegation six pointer victory at Hatfield Town (1-3) yesterday afternoon. The stand at Hertingfordbury Park is a Cold End favourite. In the race to avoid the drop the games in hand Hertford Town have over Holmer Green, Hatfield and London Tigers could prove crucial. The Tigers have hit form of late though and have won three of their last six games. The next games for the bottom four are London Tigers travelling to unbeaten league leaders and champions elect Dunstable Town on Tuesday evening. Holmer Green go to London Colney (sixth place) on the same night. Hatfield Town go to AFC Dunstable (eighth place) and Hertford Town have a tough trip to third placed Aylesbury United on Wednesday night. Snow falls at a chilly Hertingfordbury Park in the first half yesterday.